The Pic du Jer, at the foothills of the Pyrenees overhangs the city of Lourdes. It is easily recognisable by its big lighted cross. 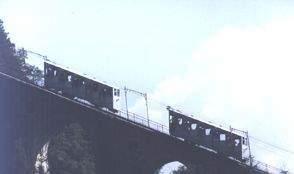 The Funicular of the Pic du Jer is historical. Since June 1900, when it was inaugurated, the Funicular welcomed 13 million visitors, who dreamed and shivered at the same time while climbing in it to get up the peak. Nowadays, the Funicular of the Pic du Jer is pulled up by a cable and connects to the uphill station, located at 950 meters altitude. Many possibilities are open: have a snack or a drink or go for a little 15-minute hike through the box and hazel trees to get to the peak, at 1000 meters altitude. Leave the loud city, relax, climb up the mountain and have a pick-nick at the top, sit in the grass and admire this living postcard! From the observatory, you will get a unique 360-degree outlook of Lourdes, the city of Argelès, Tarbes, Lannemezan, Pau and the whole chain of the Central Pyrenees. The orientation table will help you recognize these places. The main benefit of having a mountain so close to the city is to climb it up! Take your mountain bike with you in the funicular and prepare to have a fun ride down the mountain! If this ride scares you, do not hesitate to take the hiking footpath or the forest trail. This is an ideal solution if you are coming with your children! 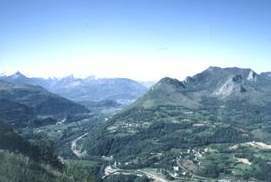 For the hikers, the Col des Troix Croix is less than an hour walk from the Funicular station of the Pic du Jer. Using the built footpaths and comfortable trails, you can go for a walk while admiring the beautiful panorama. The Pic du Jer Funicular is opened from March to November, from 9:30am to 6pm. There is a free car and bus parking lot near the station. You might also want to go to the Pic du Jer with the touristic little train or the citybus. Groups and professionals are more than welcome to contact us for service: booking, guided tour of the Pic du Jer grottos, and organisation of meetings or meals.